Mapping the Nation: Solving Challenges from Local to Global is a collection of maps that illustrate how geographic understanding fosters good governance in the United States and around the world. The book contains examples of how legislators and government agencies use GIS to solve problems and inspire action, emphasizing how the technology advances collaboration across all levels of government and can help decision-makers quickly discern and meet their constituents’ needs. April 2018, 92 pp. Paper-back ISBN: 9781589484979. Pairing the fundamental principles of Web GIS with step-by-step exercises, Getting to Know Web GIS, Third Edition, teaches readers the most current and comprehensive ways to share resources online and build Web GIS apps quickly and easily. 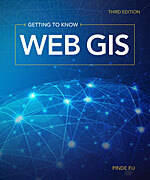 Rather than focus on individual products, the book approaches Web GIS as a holistic platform. Readers can start by building web apps without writing a single line of code and then move on to developing more advanced skills using a variety of server-side and client-facing Web GIS technology. Each chapter has readers complete an app-based project using multiple products. And this edition includes new chapters and sections that cover image services, big data and raster analysis, virtual and augmented reality, artificial intelligence, ArcGIS Arcade, vector tiling, and portal collaboration, as well as Survey123 for ArcGIS, Operations Dashboard for ArcGIS, and ArcGIS API for Python. With downloadable teaching slides and exercise data, Getting to Know Web GIS is a practical manual for use in classroom labs and as on-the-job training. April 2018, 410 pp. E-book ISBN: 9781589485228 and paperback ISBN: 9781589485211. 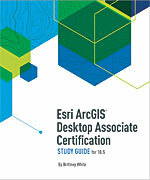 For candidates taking the ArcGIS Desktop Associate exam, the Esri ArcGIS Desktop Associate Certification Study Guide for 10.5 is tailored to meet their preparation needs. The study guide covers general exam concepts and key testing objectives and helps candidates identify gaps in their skill sets by offering a comprehensive review of the GIS skills and knowledge measured in the exam. The study guide does not teach to the exam but rather helps readers refresh their knowledge. It also contains additional material for self-study and points to existing resources whenever applicable. April 2018, 150 pp. E-book ISBN: 9781589485150 and paperback ISBN: 9781589485143. A workbook for crime analysts and students of criminology, GIS Tutorial for Crime Analysis, Second Edition, details innovative analytical methods that can be incorporated into any police department’s standard practices. 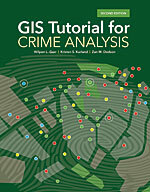 In contrast to GIS workbooks that teach skills for one-time projects, this book enables readers to build and use a crime mapping and analysis system that meets all the spatial information needs of a police department. It combines introductions to GIS and crime analysis methods with step-by-step tutorials and independent assignments to help readers learn how to prepare and maintain data, build map templates, query and analyze maps, automate map production, and do predictive modeling. The second edition has updated tutorials, a new chapter on building and evaluating predictive models using ModelBuilder and ArcGIS hot spot analysis tools, and a capstone project on hot spot modeling. It also includes a 180-day trial version of ArcGIS Desktop plus tutorial data. Instructor resources are available upon request. May 2018, 270 pp. E-book ISBN: 9781589485174 and paperback ISBN: 9781589485167. 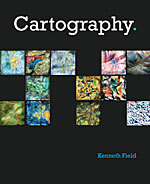 With lavish illustrations, Cartography., by Kenneth Field, is an inspiring and creative companion to have on the nonlinear journey of making great maps. This sage compendium for contemporary mapmakers distills the essence of cartography into useful topics, organized in a way that makes it easy to find specific ideas or methods. Unlike books focused on deep scholarly discourse of cartographic theory, Cartography. furnishes sound, visually compelling information that translates into practical tools for modern mapmaking. At the intersection of science and art, this book serves as a guide for designing an accurate and effective map. June 2018, 556 pp. Paperback ISBN: 9781589484399 and hardcover ISBN: 9781589485020.